Directory of American Sailing Association sailing schools located in Belize where you can take beginning to advanced sailing lessons. Our experienced instructors deliver ASA sailing school material in a Safe, Fun, and Learning environment. We work with you to define a curriculum to meet your sail training needs. 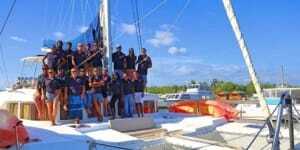 Belize Sailing Vacations offers sailing instruction in an informal, but thorough, delivery style where the Belize catamaran is our classroom and the beautiful Belize sailing our material for learning.